Multi Commodity exchange provide a free commodity charting tool in it's website, known as MCX ACT.This is a web based technical analysis chart.It contains 3 types of data : Expired commodity futures contracts, unexpired contracts,and index charts.We can analyse the charts of listed agri commodities and Metals in MCX.User can check Line chart or candlestick chart in the 'Price style' section. We can view nd evaluate intraday or historical price movement. Intraday chart is available in multiple time frames. Trader should give time interval in minutes.Suggested time frames for day traders are 5 minutes and 15 minutes.Periods in the Historical charts include daily,weekly,monthly or yearly time frames. You can also load major technical indicators such as EMA,Bollinger band,RSi,Parabolic etc.in this chart.Trendlines and Cross hairs are also applicable. Labels: Free chart, Free Commodity Charting tool, MCX ACT, Multi commodity exchange. How to use NSE TAME chart ? TAME (Technical analysis made easy) is an online technical analysis platform from National stock exchange,India.Offered as a free charting tool useful for retail investors,it provides all types of charts.Whether it is intraday or historical chart analysis,this web based chart have all form of line chart,candle stick chart and OHLC charts.If you want to evaluate stocks in the time frames such as 1 minute,15 minute or 1 hour ,you can easily manage it in TAME chart.In addition to Intraday chart features,Historical chart can be used to check daily,weekly and monthly time frames in different periods. How to use TAME Charts? Fiirstly, You need to visit www.nseindia.com and click ‘Technical charts’ in home page to open exclusive chart window.You can see both price chart and volume bars in the chart which is essential for technical analysis.You must select any market Segment like CM (Cash market which comprise all shares),INDEX (Nifty,and sectoral indices),FO(Futures and options contracts) and CD (Currency derivatives).If you have selected CM segment,price charts stocks will appear,as you type the stock name and load it by pressing 'plot' button.You can analyse a stock,or an index by reading the chart.It will help to evaluate the overall direction of the stock.Chart with a rising graph denotes bullish move in the time frame selected.Bearish trend can be identified from large number red candles and falling movement in price graph. 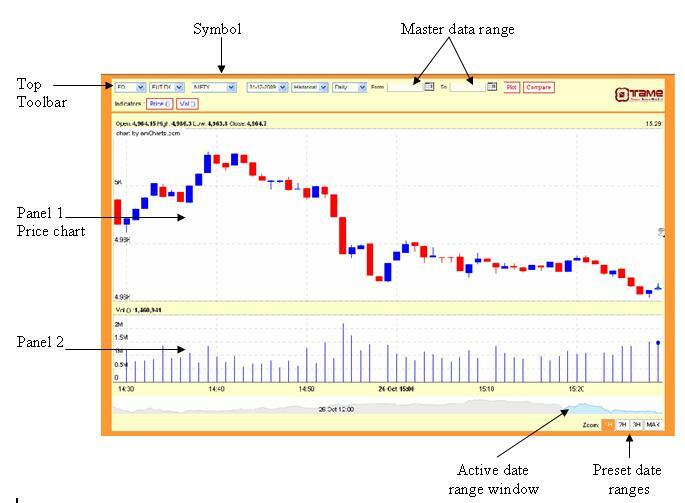 Secondly, If you are familiar with ‘Indicators’ and ‘Annotations’, you can easily apply it and evaluate the chart patterns and levels.Basic knowledge of chart analysis is sufficient to do it.Technical Indicators in TAME includes popular indicators such as Exponential moving average,Stochastics, Parabolic SAR,Commodity channel index etc.Annotations include the drawing tools such as Trendlines and Fibonacci levels. In additions to the above features, you can apply and evaluate ‘candlestick chart patterns’ too.With these kind of features, NSE TAME is a very useful for those interested in learning charts. When Intraday chart shows minor trend and movement in live market, historical chart is ideal for understanding medium term trend in after market hours.If you are interested to check it, click NSE TAME.